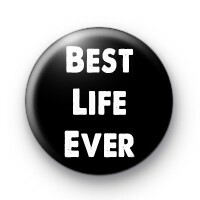 Black button badges with white text reading Best Life Ever. Standard 25mm button badge made from metal badge parts with a plastic coated design. hand made in our UK workshop.